Welcome to Franco's Pizzeria and Deli, where we serve more than just pizza! We have a great selection of meals, including pastas, chicken and more, made from only the freshest and highest quality ingredients, with something sure to please every member of your group. Our prices are the best in Syracuse, and the food's even better. Come in today and feed your appetite! Call us for you next event, whether its a graduation party, religious event, corporate function, office party or a family gathering let us cater your next event. Franco's Pizzeria and Deli is located within blocks of Syracuse University, Carrier Dome, and along the Connective Corridor. Also with in walking distance of The Crowne Plaza Syracuse, The Genesee Grande, The Parkview Hotel, The Skyler Hotel Syracuse, & The Sheraton Syracuse University Hotel. 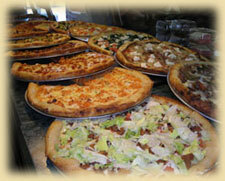 For more information e-mail us at www.francospizzeria901@yahoo.com. DELIVERY To University & Surrounding Area, North, South, East & West sides of the city, Carrier Circle, Eastwood, Lyncourt & Solvay til 3 am daily. House accounts available to established businesses.